Open-air fires are now prohibited in parts of Central Otago and North Otago as a senior firefighter warns the region is a tinderbox. 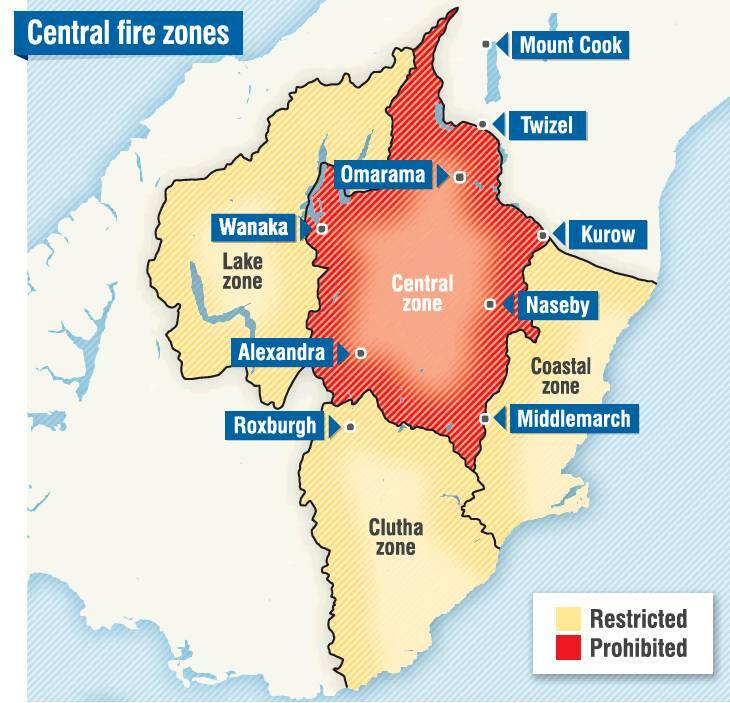 Fire and Emergency New Zealand yesterday enacted a prohibited fire season in the Central zone due to the extreme fire danger. There is now a total ban on lighting any fires in the open in an area that includes Naseby, Ranfurly, Alexandra, Clyde, Cromwell, Wanaka, Luggate, Hawea, Omarama and Otematata. Otago principal rural fire officer Graeme Still said the ``extreme'' fire risk meant any blaze in the Central zone would be near-impossible to extinguish, and firefighters could only hope to steer it. "A spark will start a fire in Central. Any fire in the open air is a prohibited activity. "What we're saying now is the fire danger level has got to a point where we wouldn't even issue a permit, and we do not want fires in the open air. The powder-keg conditions meant residents should be cautious about any activity liable to send sparks flying, for example using a grinder or mowing lawns. He urged residents to leave their mowing until dawn or dusk when the fire risk was lower. Those wanting to use a grinder were urged to hold off until a shower of rain, or wet the surrounding area beforehand. While rain was forecast for Thursday and Friday, it would not be enough to reduce the extreme fire risk, Mr Still said. Asked if he was worried about the fire risk in the zone, Mr Still was unequivocal. "I'm always worried when we get to extreme fire danger. In the rest of Otago and Southland, a restricted fire season is in place, meaning a permit is needed to light an open-air fire.